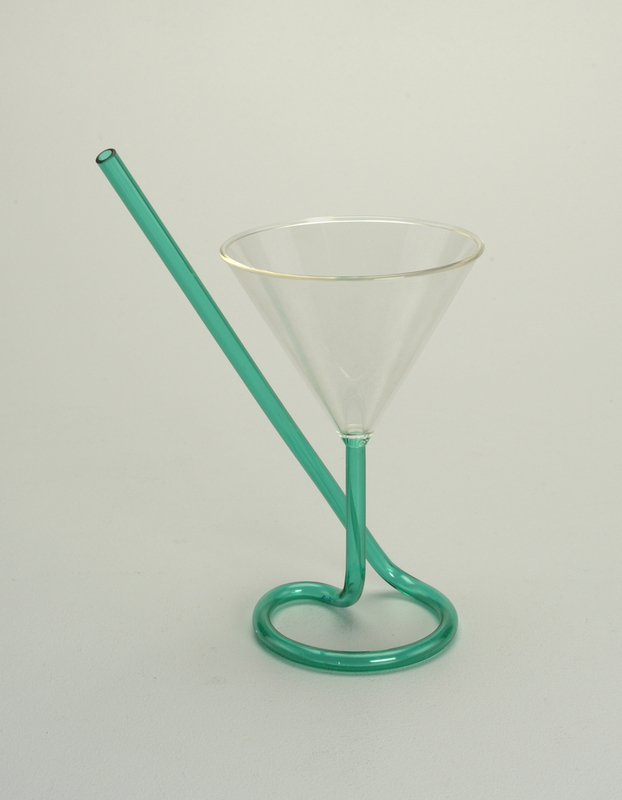 Though not directly connected to the Memphis Group, a collective of young designers based in Milan during the 1980s, this Memphis cocktail glass suggests a similar postmodernist approach to design. Postmodernism rejects the severe aesthetic and sweeping and universal claims of modernism in favor of “complex and often contradictory layers of meaning.” The playful design of this plastic drinking glass questions the relationship between form and function. The emerald-colored straw serves a dual purpose—both as the stem and base of the glass as well as an option for drinking one’s beverage. Employing colored plastic on an oftentimes austere object adds another layer of “rule-breaking” and blurs the lines between “high” and “low” art—both hallmarks of postmodern design. Richard Holloway’s patent for this glass’ design was approved in 1982, only a few years after his graduation from the London Central School of Art and Design. At the time of production, Holloway worked as a designer for the London-based company Straight Lines. Though the company produced a variety of household items such as cork screws, serving trays, salt and pepper shakers, place settings, and clocks, they received critical acclaim for their Memphis glass and for their screwball glass—both designed by Holloway. In fact, in 1983, the Design Council of Great Britain chose Holloway’s design as the most interesting design of the year. It was also featured in the Age of Plastics Galleries of the Victoria and Albert Museum around the same time. Straight Lines introduced its line of products to U.S. audiences in 1984, the same year that the Cooper Hewitt acquired the glass, through a huge merchandising campaign, selling their products in department stores such as Bloomingdales. Coming in ten different “electric colors,” the design became an immediate bestseller for the company, offering inexpensive drinkware to a large consumer base. Even before its official introduction in the United States, over half a million glasses were sold world-wide. The Memphis Cocktail Glass with Straw is part of The Virtue in Vice exhibition on view through March 25th, 2018. “Art Term: Postmodernism,” Tate. Accessed October 10, 2017. http://www.tate.org.uk/art/art-terms/p/postmodernism.